Cancer stem cells are particularly difficult to eradicate and are at the heart of why it is so hard to more effectively treat cancer patients, as the post-treatment survival of cancer stem cells drives tumour recurrence, the systemic spread of cancer and, ultimately, treatment failure. The researchers, based at the University’s Institute of Cancer Sciences and the Cancer Research UK Manchester Institute – both part of the Manchester Cancer Research Centre – investigated the role of mitochondria which produce and release energy within cells. In this context, the new Manchester Centre for Cellular Metabolism (MCCM) also played a critical role in these studies. By observing cancer stem cells in a lab setting, they discovered that mitochondria are especially important for the proliferative expansion and survival of cancer stem cells, also known as ‘tumour initiating cells’, which would then promote treatment resistance. The research was carried out in breast cancer stem cells grown in a lab, but the theory was also checked against human breast cancer cells from patients. In both cases, proteins within the cells were examined. Sixty-two mitochondrial-related proteins showed significantly increased levels. In particular, fuels such as ketone and L-lactate appeared to be critical, and in the past, they have been shown to accelerate the growth of tumours. Professor Michael P. Lisanti, Director of the Breakthrough Breast Cancer Unit, led the research. He said: “Essentially mitochondria are the “engines” of cancer stem cells and ketone and L-lactate are the high octane fuels, which promote cancer growth. Trials run by Cancer Research UK are currently underway using MCT inhibitors, which also target the mitochondria in cancer cells and the researchers believe that this could, if successful, open up new avenues of treatment. Dr Matthew Lam, Senior Research Officer at Breakthrough Breast Cancer, said: “Whilst further investigation beyond the lab is needed to test the validity of these findings, this is promising work because in effect the team used one of the unique properties that cancer stem cells have against them. 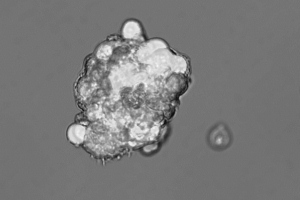 The work presented in the paper, ‘Mitochondria as new therapeutic targets for eradicating cancer stem cells: Quantitative proteomics and functional validation via MCT1/2 inhibition’ was funded by Breakthrough Breast Cancer and Cancer Research UK and was published in the journal Oncotarget.